In 1878, the Grays went abroad for much of the year: it was such a momentous trip that Mrs. Gray took two diary volumes to chronicle their journey. The Gray family hoped that this Grand Tour would help Dr. Gray, who was often deeply depressed about his health; indeed, during their Atlantic crossing, and “in spite of the storm, Dr. staggered into our room, to bring us, he said good news – that he felt perfectly well – his mind [was] as clear as ever and had had such a happy day thinking how much we should all enjoy together! Villa Serbelloni, Bellagio, Sunday, 23 June 1878: On Wednesday, June 12, Sam [Gray] left us for a few days’ excursion to Lugano & Maggiore – he had a great deal of rain but enjoyed his little trip greatly, and found that beautiful as the other lakes certainly are, this Punta de Bellagio is just the finest part of the whole. No sooner had he left us than I became quite sick … and [only] now am able to sit up once more a part of every day and for the first time now put pen to paper! The Curtises joined us here last Wednesday and expected to go over the Splugen with us; but it is so uncertain when I shall be able to take that journey, and the increasing sultriness of the weather here debilitates Mary Curtis so much, that they have wisely decided to leave tomorrow in a small carriage & pair in the wake [of] a big Berlino full of their Cadenabbia friends. Isabella [Curtis] being haunted by the thought that if they go alone, no matter how reliable a driver the directeur here gives them, they may be waylaid & murdered, two poor lone women, in the mountain fastnesses!! She is a timid woman in some ways, though plucky enough in others. Mary Curtis’ sickness first, and mine since, have just broken up lots of pleasant plans, and delayed us all; but if I had to be sick it could not have been in a better place – always excepting home! Our rooms are charming & commodious and every one is kind & attentive. Poor Mary [Gray] had a hard week of it during Sam’s absence, for she was poorly herself too – & the Doctor very wretched & unstrung by it all. So life goes – and the “perverse circumgurgitations [sic] of this piecemeal world” as [Charles] Kingsley says, are some times very exasperating! We have had a procession to-day. Streets & houses hung with bright rugs & other draperies; robed priests bearing large gilt crosses [and] maces &c followed by matrons in black dresses, with red kerchiefs; maidens in long white veils; children in white; boys with bright sashes; men in red dominos; then more priests in white & red; then a canopy held over a be-gorgeously attired Bishop, whose robes were upheld by as gorgeous acolytes; then more priests – all marching slowly & solemnly to the briskest band music giving several beats of music to each step; the band alternated with the voice; and the harmonized chanting & recitative ‒ the strophe & antistrophe so to speak of responding men’s & boys’, to women’s & children’s voices, came to our ears very softly & sweetly as the procession wound in the town below, like a scene from an opera. Mrs. Dan.l Spooner of Boston, her daughters, & sister Mary Torrey are here with the G. Augustus Woods of Philad[elphia] and the pretty wife & daughter of the rich “Cocoaine” & “Extracts” Burnett. I have not seen any of them – the Redpaths have left – & that very competent Mrs. Cubitt & her boy. It will be a company of strangers when I go down[stairs] again no doubt. Hedwiga Regina Shober (1818–1885) was married to Dr. Francis Henry Gray 1844–80. Entry for Tuesday, 12 March 1878, at Chester. Both entries from the Hedwiga Regina Shober Gray diary, R. Stanton Avery Special Collections. The Grays’ second son, Samuel Shober Gray (1849–1926). Two cousins of Dr. Gray’s sister-in-law, Sarah Frances (Loring) Gray (1811–1892). The Splügen Pass in the Alps between Italy and Switzerland. Or Berline, a model of carriage with two interior seats. On the western shore of Lake Como. The Rev. Canon Charles Kingsley (1819–1875), author of The Water-Babies (1863). Elizabeth Elliott Torrey (1825–1907) was married to Daniel Nicholson Spooner 1847–69. Presumably Ellen Otis Spooner (1856–1924) and Mary Torrey Spooner (1864–1946); another daughter, Elizabeth Elliott Spooner (1851–1945), had married Henry Howard Fay in 1876. 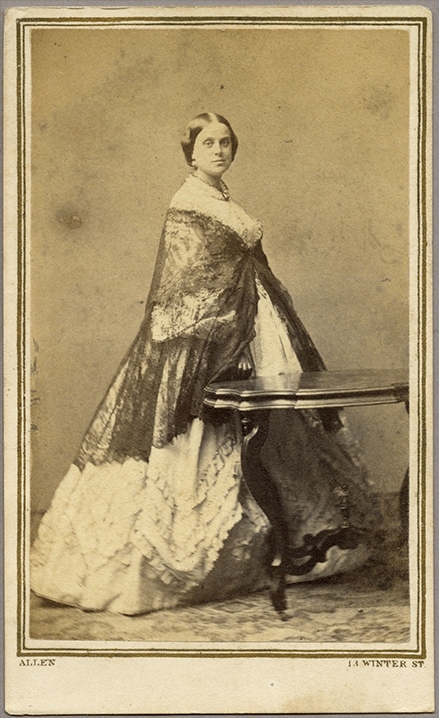 The Torreys’ cousin Josephine Rebecca Cutter (1830–1906) was married to Joseph Burnett 1848–94; their son Edward had recently married Mabel Lowell, the only surviving child of the poet and diplomat James Russell Lowell. What a small world. We will be in Bellagio in September and have booked a stay in the Villa Serbelloni. It is now called the Grand Hotel Villa Serbellon and is on Lake Como where the two arms of the lake meet. Thank goodness it was renovated in 2012.